Globe Telecom’s free Facebook offer helped drive the company’s subscriber uptake and surged user engagement to get into mobile browsing for free. The offer also doubled mobile browsing adoption among the company’s customers. At the end of 2013, Globe subscribers have reached a fresh record 38.5 million, a 16% rise from 33.1 million subscribers at the end of 2012. Most notable is that fourth quarter gross subscriber acquisitions registered a quarterly high of 8.8 million subscribers, a 19% jump from the previous quarter, steered by record acquisitions of the company's prepaid (Globe Prepaid) and TM brands. Combined, Prepaid and TM gross acquisitions accounted for 98% of acquired SIMs during the period, driven by market relevant promotions during the quarter, notably the Free Facebook campaign. Despite a slight increase in churn rate of 5.9% from 5.7% in 2012, full-year net incremental subscribers soared 74% to 5.36 million from 3.08 million in 2012. Globe launched in November last year an exclusive and groundbreaking partnership with Facebook allowing its subscribers to have free access to the social networking site using the Globe data network. The company shared its technological capabilities and modernized network infrastructure to drive the ambitious commercial offer, which was aimed at increasing mobile browsing adoption in the country. "By providing free access to Facebook, many of our subscribers have realized the benefits of mobile internet connectivity which helped sustain continued growth in subscriber acquisitions," Globe President & CEO Ernest Cu said, adding that the offer also more than doubled mobile internet adoption among Globe customers. Aside from its collaboration with Facebook, Globe has also partnered with popular message applications such as Viber, Facebook Messenger, Kakao Talk, WeChat, Whatsapp and Line, allowing many of its subscribers to communicate through mobile data services and providing alternatives to traditional telephony services. The collaboration with Facebook brought together first-of-its-kind customer experience innovations such as availability in all Facebook mobile platforms, advice of charge notifications, one-click to purchase data plans & data access lending to access links outside Facebook. 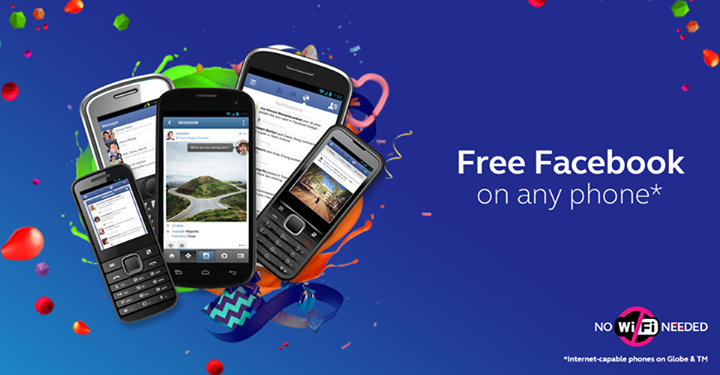 The free Facebook offer started in October and ends on April 30.